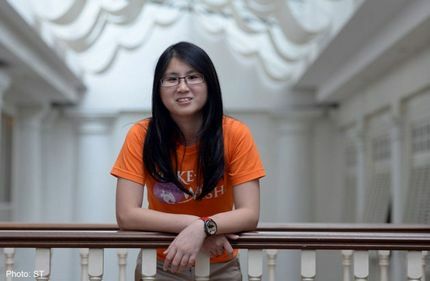 At the age of 13, when her peers were embarking on a new phase of life in Secondary One, Theresa Thang was battling brain cancer. In January 2006, she had surgery to remove a tumour growing near her optic nerves. This was followed by six months of chemotherapy and radiotherapy. But she also remembers a turning point, when the “negativity stopped”. At the tail end of her treatment, the Make-A-Wish Foundation Singapore organised an exclusive outing to the zoo for Ms Thang with her family and friends, adding special touches like having photographs taken with orang utans and feeding the white tigers. The international foundation, which started a branch in Singapore in 2003 and grants wishes to children who have life-threatening illnesses, also presented Ms Thang with two frogs after she stated a wish to keep them as pets. After getting better, Ms Thang started helping out at the foundation by putting together computer slideshows at its events and making balloon sculptures for kids. She is now studying veterinary science in Australia and hopes to become a “wish granter” herself. These volunteers work with the children and families to fulfil their wishes. “I hope to be a source of positivity to the kids and to encourage them that it is not over yet,” Ms Thang said. Among the over 250 volunteers at the foundation, around 20 are former “wish kids” like Ms Thang. They volunteer in various capacities – such as becoming wish granters, performing at events and supporting the foundation in regular activities, such as its annual Christmas party. To date, Make-A-Wish has benefited over 1,050 children – granting them wishes, from becoming a race car driver to owning a piano. While between 100 and 120 wishes are granted annually, Dr Goh feels that more children can be helped. “That is only about half of the true numbers that are out there in society,” he said, adding that more than 200 children are diagnosed with some kind of life-threatening condition every year.